Not all items at the second-hand shop are used goods but for the most part when you walk into a store that carries products that were donated you can expect to find treasures as far as the eye can see. Both Mrs. CBB and I spend about an hour each week shopping for used goods but various reasons which some people may not understand, care about or think is ridiculous since we are debt free. What are used goods? Essentially, used goods are items that were purchased or hand-down to someone who no longer wants them so they donate them or give them away. You can find used goods at garage sales, second-hand shops, bazaars, auctions and even consignment stores. The idea around used goods is that they are sold for a fraction of the retail cost which intrigues buyers who simply don’t want to pay top dollar when they can get it cheaper. Some people just love the hunt or the walk down memory lane because the amount of vintage you see amazes me. Last week my wife found animated glasses that she collected as a child and the smile on her face was from ear to ear. Over the course of shopping for used goods we’ve bumped into quite a few ‘regulars’ that we’ve come to notice each week and started chatted. Last night in particular I was looking at Tupperware which we have quite a bit of and an older gentleman stopped me to say how incredibly expensive it is to buy new so he opts for the used goods instead. What amazed me was how he went into great detail about Tupperware and how he used to sell it, the costs of it and why he wouldn’t buy it new unless he wanted a specific item. He says that he can find any and all the Tupperware he wants at used goods shops around the city, and that’s the truth. We have bought all of our Tupperware at used goods shops because we like the quality and it’s been around for donkey’s years (that means a LONG time). Then to step up the conversation a notch he tells me that back when he was younger he was a sales rep for Tupperware so he knows how expensive it is. “There’s no reason for me to buy brand new when I can find brand new at used goods shops”, is what he said to me. He’s right and it’s not just Tupperware, it’s just about every product provided you have the patience and desire to look around. Used goods stores doesn’t always equate to used condition, it simply means that the items were previously owned or purchased by someone else and then passed on, sold or donated to another company to sell. If you compare used goods stores to garage sales you can pretty much wager that the same people who love garage sales love to shop at used goods stores because it’s the fun frugal thing to do. While discussing on Canadian Budget Binder Facebook how the private, for profit organization used goods store Value Village doesn’t get their merchandise for free it occurred to me that misconceptions still exist. At least once a month The Canadian Diabetes Association and other non-profit organizations call our house wanting to know if we have any clothing or small household items for donation. If we say yes then we leave out what we have on the porch on pick-up day and they will send a driver to collect it. They then sell these items to shops like Value Village who then turns around and sells it for profit to us, the used goods consumers of Canada. We knew that they sold the items to Value Village and they were weighed and sent in as we see it all the time. These monster racks that are jam-packed are shipped in by truck and wheeled to the back of the store where employees sort through, price and stock the used goods for sale on the shelves. At least that’s what we’re told goes on behind the swinging doors at the back by an employee. Cart after cart comes flying out ready to be put on shelves. One CBB reader explained what he knows of the process collection and payment of donated items. “They bring all the product they collect here (to the store’s Community Donation Centre). We weigh it and we write them a cheque.”They pay by the pound (sometimes), still can’t justify $14.99 for a used pair of jeans. Another fan who used to work for Value Village chimed in with her experience. I used to work at V.V. we had to load all the donations, even the ones coming directly into the store onto large carts. They all were weighed when full, recorded and then put into cue for sorting and pricing. The only thing that doesn’t get weighed is furniture. Last night we decided to drop by Value Village to donate two bags of household and baby items we no longer needed to see exactly what happened. We walked in the side entrance of the building where we were greeted by an employee who accepted the bags. Inside the small room there was a computer, desk and some large sorting bins. We had to ask about the donation card as it wasn’t initially offered to us. 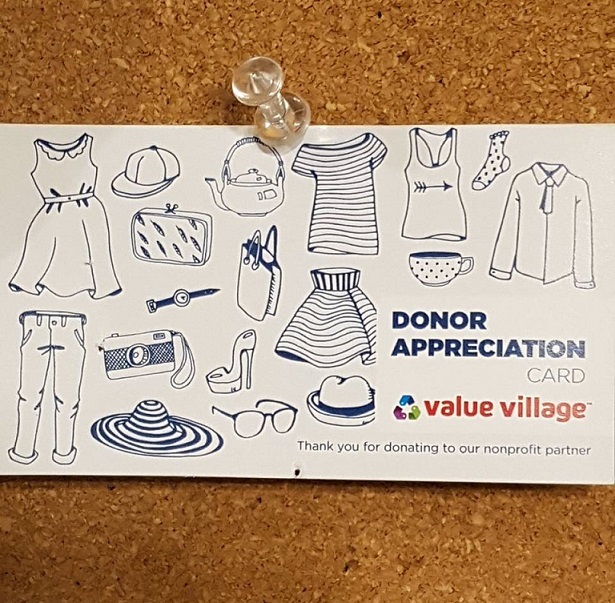 A donation card is given to people who donate used goods to Value Village. 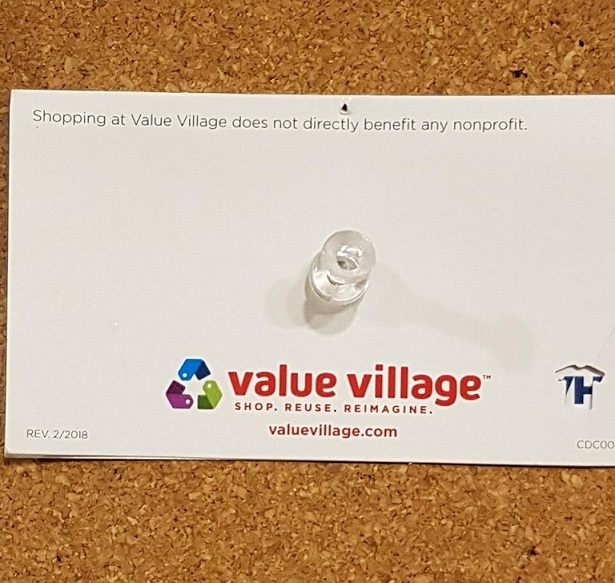 The front of the card states “Thank-You for donating to our non-profit partner” and the back states, “Shopping at Value Village does not directly benefit any nonprofit. 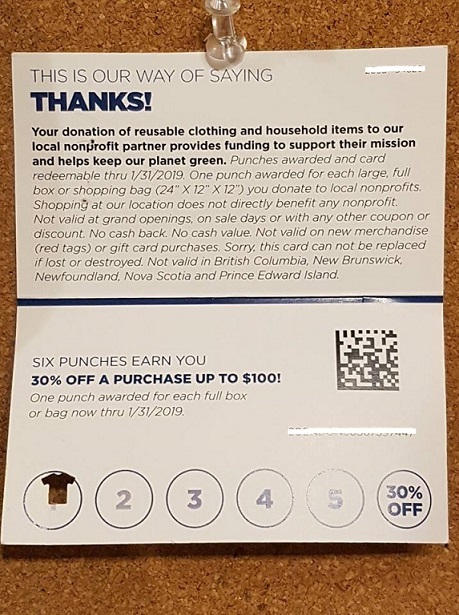 The card is shirt punched (see photo) by the accepting employee and after 5 donations of used goods the cardholders can get 30% off a purchase up to $100 in the store. So, technically yes Value Village does pay for their used goods IF the donating customer brings it in and gets a card stamped or signed. I also noticed that we should have gotten 2 stamps for the 2 full bags we donated as it states in the fine print ” One punch awarded for each large, full box or bag (24″ x 12″ by 12″) thru 1/31/2019″. As you can see that did not happen for us but if we donate again we will know better to make sure the employee follows procedure. With your donation card or stamp you also get the opportunity to fill out an online survey and at the end you get a code for $2 off your next $5 purchase. You may also receive the survey with your cash receipt as every fifth customer receives one according to numerous cashiers at Value Village. We’ve gotten them many times and always do them even though $2 doesn’t seem like much the survey takes an entire 2 minutes to complete. One question in particular that bothers me is when they ask if you found a treasure and what it was. The only reason I can come up with for them asking that is because they want to know what items they are pricing too low. So if I were to say I found a $100 toy for $9.99 the next time they have one donated you can bet it will be $50.00. Nope, I never answer this question and perhaps I’m thinking too much but that’s what my frugal radar tells me. You may also notice that they don’t want anyone to just dump used goods off at the store like they used to. There were times we’d go to the store and the front and side of the building was jam-packed with used goods that were dropped off at all times of day and night. I’m sure by stopping this process it was a way to control people dumping whatever they wanted to get way from bringing stuff to the dump and paying a fee. Another reason is that it is unsightly and to combat theft. So now if you want to donate you have to peak your head and say hi, I have some items to donate and the employee(s) working the front donation centre will help you out. Sometimes they are waiting outside too so it really depends on what is going on at the time. Whether it goes beyond there I don’t know but I’m sure there are people who donate without getting a card stamped but that’s up to them although Value Village should also offer it to them without asking. In a way it reminded me of the Scanning Code of Practice, if you don’t ask, you don’t get. Consider though that there are people who really don’t care whether they get a donation card or not. If were to bring those same bags to The Thrift Store, Bibles For Missions or The Goodwill we would have just handed them off and away we’d go. There are no cards to punch or sign and no discounts. This is why you may find prices to be cheaper in these shops, some run by volunteers and no taxes are added. So, are you really benefiting by shopping at Value Village as opposed to the other used goods shops? Not really unless you are looking for something specific or plan to donate enough to get your 30% off. Some shoppers don’t have options as they may only have one or the other used good shops in their city. 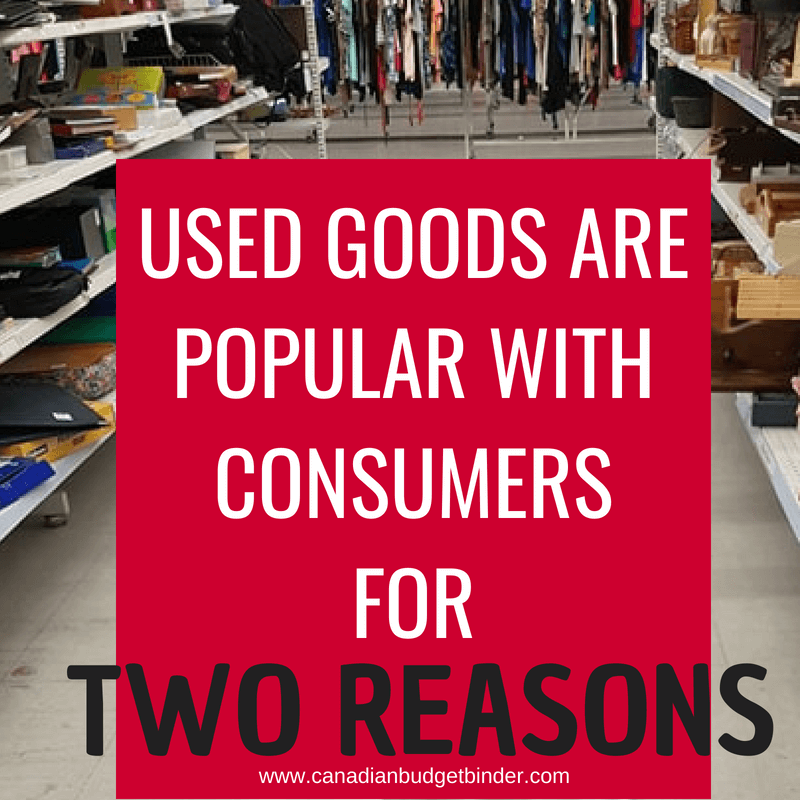 Over the course of our used goods journey which seems like FOREVER because we are too frugal for new unless we have to we’ve come to the realization that there are really only two reasons why people shop second-hand. I wanted to share this today because too often people ‘judge’ used goods consumers as being too broke to buy new. Labelling shoppers based on financial status kind of irritates me but that snob part of society will always be there. That’s why I thought it was important to say hey, saving money is something that almost everyone wants to do whether they shop used or not. To be honest I bet that shoppers who are tight on cash are very happy to have used goods stores as options then having to suffer through some today’s prices at retail stores in the malls and big box outlets. Sure, there are times you can find great deals on clothing and items that go on sale but you still can’t beat saving money the way we do buying used or new at second-hand shops. Why are people shopping at used goods stores? So, what are the two main reasons why people shop at used goods stores. Well, from our personal experience and expertise at talking to anyone who wants to talk in the stores for educational purposes this is what we’ve learned. The only reasons people shop at these stores are to save money because they don’t have to buy brand new at retail prices (sale or no sale) or to make money. For those of you who wonder how you can make money from a used goods store, it’s simple. Just as the store buys used goods from donation organizations and random donations then re-sells it this process can go a step further. There are smart shoppers out there looking for bargains that are worth far more than the used goods store is willing to sell it for. They are bargain hunters and vintage shoppers out there and they know prices and will buy low and sell for the best possible price without hitting top value. The reason for this is no one will buy something unless they are still getting a deal. In some cases you may have collectors who are willing to pay more for something because it is rare and hard to find. We had a guy pay us $40 for Little Tikes Truck that was no longer being manufactured and he wanted it to finish his collection. We paid $5 for it from a guy on Kijiji who even delivered it to our house along with a few other items we bought from him. It wasn’t until we had our son that we realized how lucrative buying an selling could be and you only have to scour Facebook, Kijiji and other online buy and sell groups to notice it’s a big business. Furniture re-purposing and painting is another grand money maker as it jewellery hunting. One of the regulars at Value Village has found rings for under $20 but worth thousands and sells them for that much on Kijiji. You can buy a solid wood side-table for $10, clean it up, chalk paint it and sell if for hundreds of dollars and YES there are buyers for all this stuff. There’s always a buyer even if one buyer thinks your price is too high someone else will come in and swoop it up. It kind of reminds of real estate where one price is high to one buyer but perfect for another. We all have needs and when a product fills our needs and the price is right the items will sell. It may not sell right away but it will sell. For use we are both savers and money makers but nothing like some of the big rollers out there in the used goods business. What we like to do is buy what we need for cheap and sell other items to compensate for those purchases. In the end what happens is what we buy to keep or use we end up having that paid for with profits from sales of items we don’t. When we are done with something such as clothing, shoes, toys, pretty much anything we sell it. There’s no point sending stuff to the land-fill and if we can make our money back and more, why not do so. So the next time you hear someone label people who shop at used goods stores, garage sales, community events and so on as too poor to shop elsewhere just keep smiling and move on. What they don’t know is that YOU are far better off with the savings in your pocket then wasting your time trying to convince them otherwise. Being smart with your money means going above and beyond caring what other people think about how fat your bank account is. Oh and by the way while we were donating we noticed a really nice toy for our son on the table that was priced for $9.99 worth over $100 and with-in minutes it was out on the shelf for sale and we bought it! Discussion: What other reasons do you think people shop at used shops besides what I’ve explained? Perhaps I’m missing something or other experiences you’d like to share. I’d love to hear from you so please leave a comment below. I am particularly fond of our local church, hospital and SPCA Thrift shops, as a volunteer, donator, and shopper. Cost is one factor, but so is the frugality that is respectful of trying hard not to be part of the throw away culture. Reduce, repurpose, or just don’t buy: we have to get with the program before we’re buried in our own garbage. My family buys second hand not only to save money, but also because it’s better for the environment. We are giving used clothes etc extended life instead of buying new and therefore keeping things out of the landfill. And yes we are also the people that will bring home stuff from the dump that is perfectly fine. My husband has even made some cash reselling stuff he found at the dump. Its amazing what people will throw out that is still in perfect condition. Our society today is a consumer society and it saddens me to see how wastefull people are.